In an attempt to steal Shaquille O’Neal’s Twitter thunder, UFC president Dana White hit up the blue-birded social network just moments ago to announce the biggest welterweight scrap currently available in the sport of mixed martial arts. “U wanted it! U GOT IT!!! 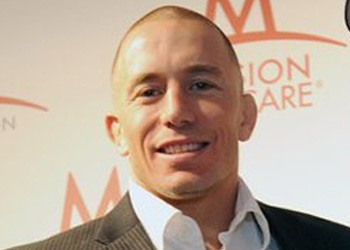 GSP vs DIAZ Oct 29th UFC 137 at Mandalay Bay in Las Vegas,” White tweeted Wednesday afternoon. After UFC king Georges St-Pierre successfully defended his crown against Jake Shields in April, White touched on Zuffa, LLC’s first potential crossover fight, but suggested he didn’t want to interfere with existing contracts. Strikeforce welterweight champ Nick Diaz met with White at the UFC’s corporate office a couple of weeks ago to discuss his future. However, MMA’s ultimate shot caller professed over the UFC 130 weekend there were still “plenty of hurdles” the company faced before the superfight could come to fruition. After putting Paul Daley down in thrilling scrap in April, Diaz expressed great displeasure in the lack of zeros in his paycheck. In search of greener pastures, he signed to face former IBF and IBO super middleweight champion Jeff Lacy in a boxing match this coming fall. That bout was quickly called off, courtesy of Diaz’s powwow with White, with Lacy’s promoter hinting that the controversial grappler had something special already lined up. According to White, UFC 137 will jump off October 29th inside the Mandalay Bay Events Center in Las Vegas, Nevada. No other bouts have been confirmed for the show at this time. For you gambleholics that were wondering, GSP is more than a 4-to-1 favorite to dispose of Diaz. Mr. 209, on the other hand, checks in at +325.